Upgraded the StingRay and tested the IR line follower with Parallax demo code. Adjusted only a couple things to get it to proof of concept working. Looks like this will be a slick hardware add-on that will allow for lots of software tweaks! NICE. Looking forward to another volunteer opportunity with the FRIST FRC program. April 4-7, 2012 Madera, CA will be hosting the FRC event. 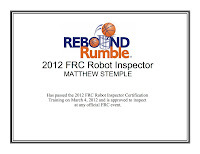 I am signed up and confirmed for field assemble, robot inspecting, field repair/reset and field disassemble. Going to be a long couple of days! I had a blast working the Sacramento Regional. Getting ready for my 3rd Unofficial Parallax Expo April 13 & 14. Looks like the name changed and its out of beta testing to become the Official Expo this year as two day event with several contests. 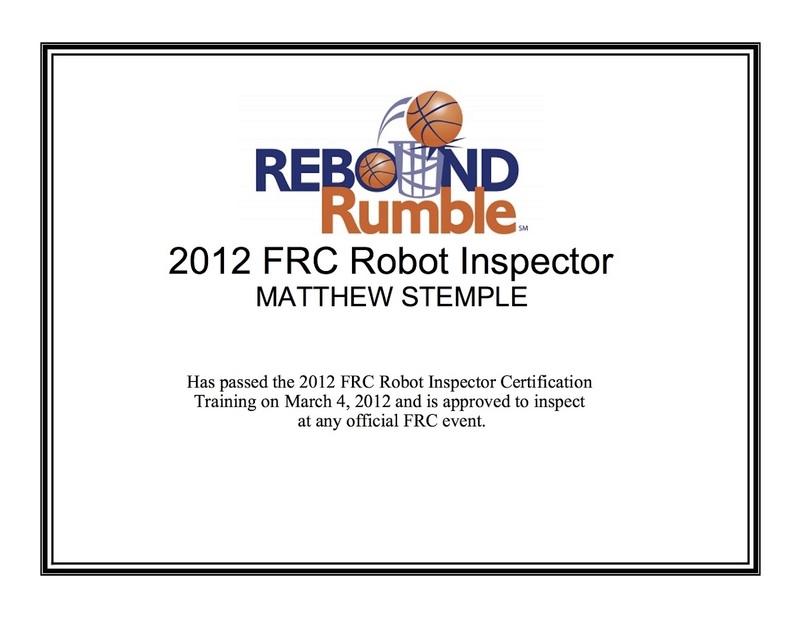 This will be the first robot related event I will be competing in - 200 ft line following contest. After considering a Lego bot, I decided to add on to the StringRay. Picked up this IR tracker unit after scoping out a couple options from both Parallax and Pololu. The unit pictured appears to be the most robust in terms of features and development assistance capabilities. Also the most expensive, however it will cut the hardware development time to near ZERO and allow me to focus on writing the Prop Spin code; still very new to me so the less time tweaking hardware the better in order to be ready for the event. I am waiting to hear back in my StringRay's RC radio for manual control will be considered 'illegal' for the event. It is how I manage the kill switch and camera controls. I tend to watch and manage perceptions very closely with regard to the services I manage in my profession. Its not often when I step back and think about my own perceptions. Having read several early notes about the MS Windows 8 preview, I downloaded it, created a new VM and fired it up. No issues initially but found the UI on a non-tablet device to be disorienting. I am still getting use to the mouse scroll button going the opposite way on OS-X Lion (even though I am use to it on the iPhone). During the install I was finding myself concern with the personal info required to install Windows. It wasn't until the next day that I figured out what it was trying to do; getting all APPLE'ISH. Perception is funny because when I bought into the MAC stack several years back I wasn't that concerned about getting an iTunes account. But when Microsoft does it, better watch out!?! Why is that? Apple has done a very good job appealing to the consumer, guess that is why at work I have a Windows box. After getting past Microsoft's attempt to FRIEND me, I immediately started to wounder how the Metro thing would really work in the enterprise environment. For heath care I suspect it would be great given the tendency to run a single application as a primary tool. Some touch screens would make it easier on the desktop. Since I didn't have a touch screen on the desktop, I had to fumble around a new user interface trying to figure out how to close an app (drag down from the top). Disappointed to report I didn't figure it out without Google... It always humbling when learning a new platform--its a good reminder to have patience when support others who don't sit in front of a computer for a living. Looking forward to volunteering at this year's FRC (F.I.R.S.T. Robot Competition). I have read about this event in SERVO the past couple years, however seeing one of these incredible robots first hand at Robogames got me really interested. Given this is my first FRC event, I have a lot to catch up on. Spent most of Saturday reading the various guides and rule books. After being selected for something technical I got to run through a certification exam (complete with a certificate). I was a little concerned that I might have been selected to volunteer as a food vendor or parking lot attendant... I would have done it either way. After finding out about the certification requirement, I thought perhaps I was in over my head. Of course after doing homework it all was a lot more clear. The robots all share common sub systems that are configured in standard ways. 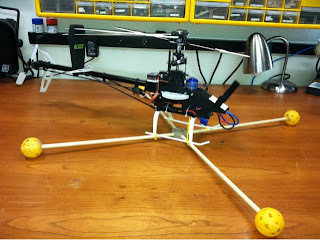 The fun begins when the participants design the platforms for the sub systems and the various end effectors attached. Here is the description of the job duty. I would love to get my hands on a KOP (kit of parts). Lots of hardware goodies and software; heavily subsidized by various sponsors. FIRST was around when I was in school, but not at my school. I am looking forward to this because it will continue to expose me to more of the concepts I picked up from the Sierra College CIE program. Now that the MBA is complete I need to finish the CIE AA. I suspect given the Junior College crunch right now getting enrolled will be harder! 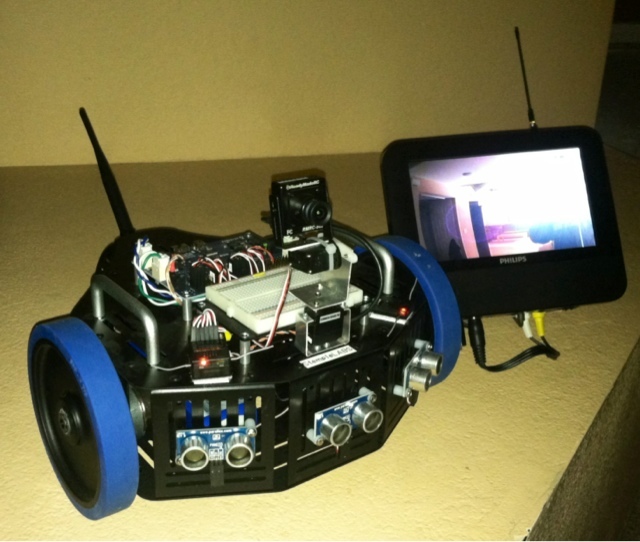 This Stingray robot chassis and drive system is a Parallax kit that I purchased at the Propeller Expo 2011. It came with the now discontinue Propeller Robot Control board. This included regulated power, motor speed controller and other peripherals. The kit was built right away and I tested with various demo programs, but the it sat on the shelf with my other bots (all in various stages of form and function). Of course after my first crash, in order to maintain enthusiasm for this hobby, I considered the challenge of taking it apart and back together again. Turns out that was the easy part. With new parts things were slightly out of adjustment. I started to adjust only to find other things were not out. Back to reading about theory again. Figured out specifically how the swash mix works, and how to tweak the gyros. I turned off the gyro and attempted to drive around on the ground. Quickly I gained a sense of how critical that technology really is and I developed a new sense of how complex the PID loop is that is in use. 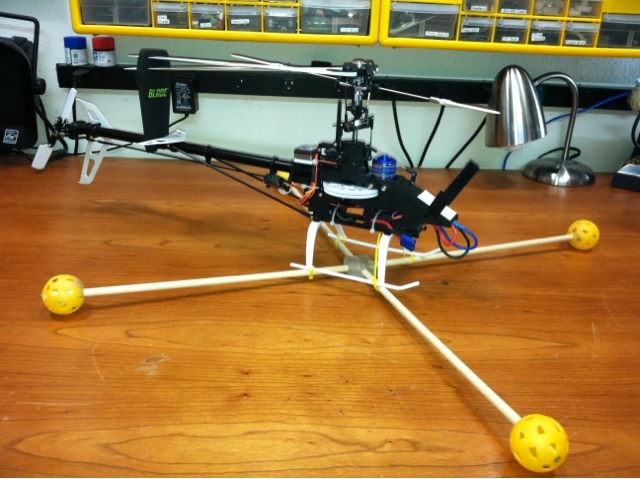 Looking forward to understanding more about flybar-less setups in the future. Current challenge is to tweak out the vibrations I get on initial spool up. With the slightest tap on the rudder it comes out of it for a smooth hoover. However how left stick on the rudder causes the bird to drop like a rock. I suspect my HEAD SPEED isn't were it needs to be. My pitch is likely off also. I need more tools! A contact less RPM gauge. Its on the wish list. I used a pitch gauge and swash plate leveler. Now that I understand how these tools work, I have seen online others that would appear to work a lot better then my set!